Wakesurfing has taken watersports by storm and is quickly growing into one of the most exciting and challenging sports behind a boat. Originally conceived by surfers in the early 60s and 70s, many people thought they could simply ride a surfboard behind a boat. It wasn’t until the last decade that boat and board designs have allowed the progression of wakesurfing to reach new heights. 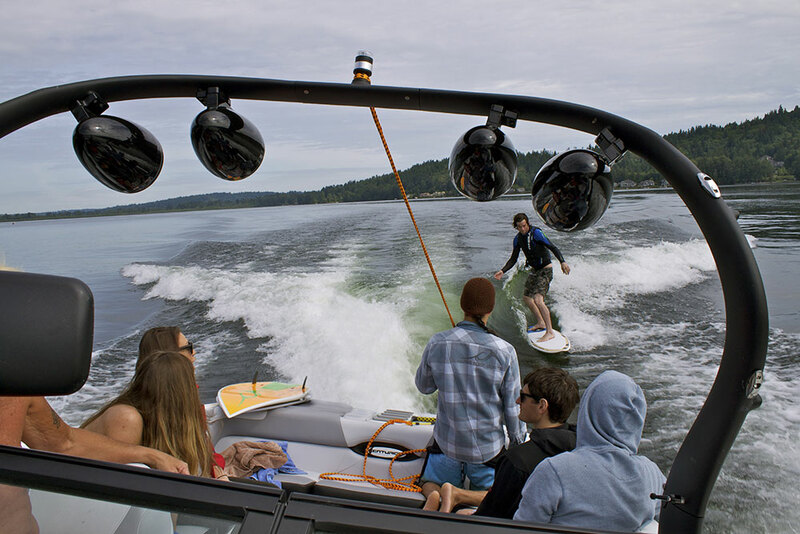 Tow boat manufacturers are now designing boats specifically for wakesurfing. Regardless of what you're driving, it's important to setup your boat properly for wakesurfing. Given how fast the sport is taking off, we’ve compiled this guide on how to get your boat outfitted for safe and fun wakesurfing with the help of Todd Gaughan, Business Development Officer at Inland Surfer and Marketing Director at Finline Industries, Inc., manufacturers of Centurion Boats. Read the full interview on our blog. The first thing to understand about building the perfect wake is how the wake is produced in the first place. Wake is created as the boat moves through the water; the boat's hull displaces water, and the water returns to where it previously was. This constant flow of water creates an "endless" wave moving in the direction of the boat. The general rule of thumb is more weight in the front of the boat creates a shorter wake in height but a longer wake in length, and vice versa if there is more weight in the back. When you’re wakesurfing, only one side of the wake is being surfed. To increase the wake’s size on either side of the boat, you need to increase the amount of weight on that side of the boat. Passenger placement can play an important part in your boat's wave. In order to have a big enough wake to wakesurf, proper ballast is required. These days there are wakeboarding-specific boats that come with a factory ballast system. Some manufacturers have ballasts built into the floor, and typically a professional configuration will involve placing after-market sacks on top of that. Check with your local dealer to determine what kind of plug-and-play systems are available to go with the manufacturer’s ballast and what type of custom ballast the manufacturer offers. Be conscience of the amount of weight the manufacture says not to exceed. While most wakeboarding and wakesurfing boats do come with a factory ballast system, it won’t always be enough to create a great wakesurfing wake. So in order to create a wake big enough and consistent enough to wakesurf behind, you’re going to need to add more weight to your boat. Before you begin to add additional weight, take into consideration the amount of weight that is in your boat. Where people sit depends on the number of passengers in your boat and the type of boat you have. For example, in a Centurion, everyone should sit evenly throughout the boat; on the other hand, in a Malibu, it helps to have everyone sit on one side of the boat. People should sit in a safe, comfortable place that doesn’t introduce any risk of falling out of the boat. It may take some time with your boat to determine the best places for people to sit, and remember, you are the captain. Keep in mind though: Extra weight means less ballast is needed. Adding ballast bags to your boat helps it sit lower in the water, especially on the side you will be surfing on. Ballast bags (fat sacks) can have a huge effect on your wake as well as the way your boat drives, so before you decide to invest in them, determine how much additional ballast you need and where you need it. An optimal wakesurfing wake will generally include the majority of the ballast weight in the back corner with smaller amounts of ballast distributed towards the front in order to lengthen and smoothen out the wake. Never trailer your boat with ballast in it. The extra weight on your trailer will affect road handling, burn more fuel, wear out tires, and may cause failure of the trailer bearings. Each boat is set up differently, and it might require some trial and error before finding those sweet spots in your boat, but once you do, it will create a bigger wake that's easier to surf. Also, keep in mind the personal preference of each rider. Skim-style surfing usually involves a slightly flatter wave than surf-style. Wake shapers are perhaps the easiest, best way to improve your boat's wake, especially when used in conjunction with ballast. And they're incredibly easy to use, too. Attached to your boat's stern via velcro or suction cup, their angled shape is designed to displace water for a crisper, cleaner, bigger wake. Like ballast, there is likely some trial and error involved before finding the ideal placement for your wake shaper. In most cases, it's also incredibly easy to change the placement from one side of the boat to the other for a right or left break. Just because you went out and bought a wakesurfing board does not mean you can get behind any boat and give it a try. The most important rule you need to know about wakesurfing is only wakesurf behind inboard direct drive boats or inboard V-drive boats. Inboard wakeboard boats are a necessity for this sport as the propeller is under the boat, and it is far less likely to make contact with the rider. Wakesurfing behind an outboard boat or I/O (inboard/outboard) boat exposes the rider to the propeller, which can lead to serious injury or even death. 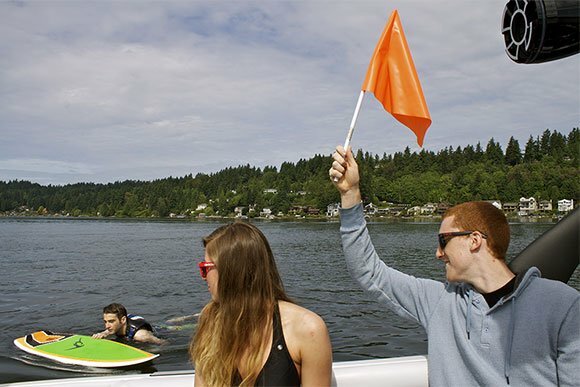 For your sake, your friend's sake, you parents sake, the whole sport's sake, and your pretty face's sake, never wakesurf behind a boat with an exposed prop. Also, be aware that not all wakeboard boats are designed to be on their side all day. One of the first steps you should take to upgrade your boat is get a prop designed for wakesurfing. Call the manufacturer for more information on this (you will need to know your elevation). There are other modifications you may need to make to your engine as well. For instance, the engine could act as though it is low on oil since the oil pan will be on its side for long periods of time. If you don’t, you’ll be wasting gas and not get the most out of your boat. The engine on direct drive boats is located in the center of the boat, which means the bulk of its weight is centralized in the middle. 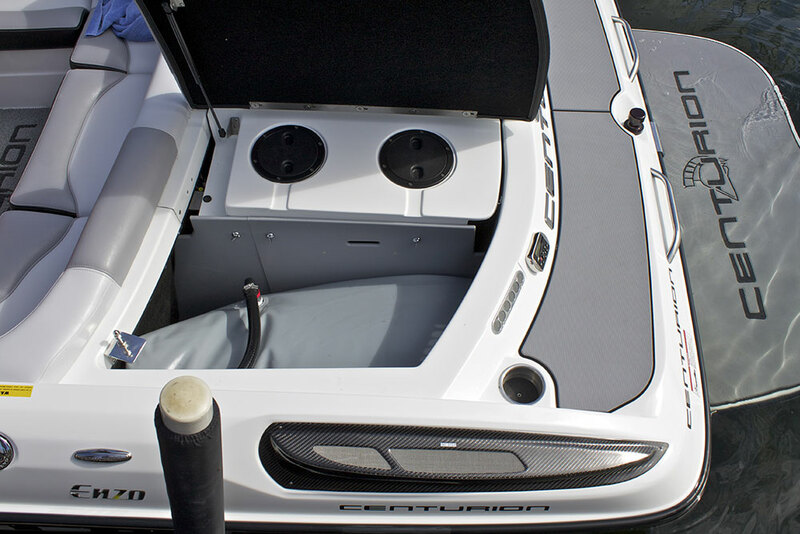 Therefore, you’re going to want to put ballasts bags on the side that you are wakesurfing and directly behind the engine as well to add weight to the back of the boat. See image from Fly High. If you have a V-drive boat, the engine is near the rear of the boat. You will want to weigh down the side that you are going to wakesurf on with a greater amount of ballast next to the engine. Then, add a smaller amount of weight directly in front of that, either under the seats or on the seats, still on the side you want to wakesurf on. You want to get a slight lift and always keep the rub rail above the water and experiment from there. See image from Fly High. We recommend investing in a great wakesurf rope. Traditional wakeboarding ropes are long and thin. 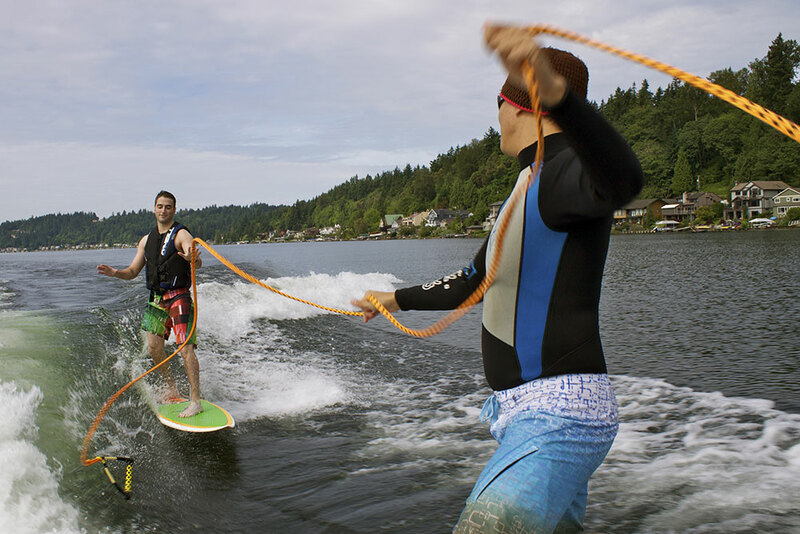 The thicker and shorter design of wakesurf ropes makes maneuvering much easier for the rider. 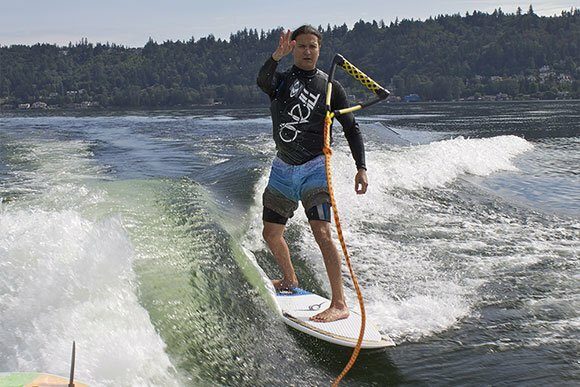 Wakesurf ropes will often have extra knots and grips throughout the rope, allowing the wakesurfer to utilize as much or little of the rope as they want when positioning themselves on the wake. When not used properly, the rope is an added hazard to the safety equation. Always throw the rope safely into the boat. Or to a friend ready to receive it. When pulling up a wakesurfer, you should accelerate even slower than when pulling a wakeboarder. Boat speed for wakesurfing will vary with make, model, and amount of weight, but usually good waves form around 10 mph and professional surfers will cap out around 12.5. 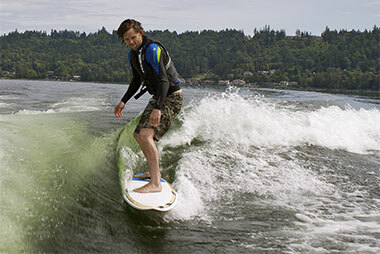 Skim-style boards perform best at about 1.5 mph slower than surf-style boards. If you are on a river, your speedometer can be adjusted to accommodate the moving water. Always make sure your speedometer is calibrated as well. You want to start slow and make small incremental increases. Ideally, you want a thigh-high wave with a clean face and no whitewater on the lip. Like all water sports, staying safe is all about the fundamentals. “You need to know your equipment, you need to know the sport, you need to know your crew, and you need to be in a position to command that operation and not jeopardize anyone’s life,” says Todd Gaughan. There’s a lot that can go wrong and you can prepare yourself by knowing the fundamentals. Some states do not require the use of a life vest while wakesurfing or waterskiing, and some don’t even require the use of a mirror or a third person to watch as an observer. So knowing the laws is important, but also thinking above and beyond the law is necessary to keep your friends and family safe. Purchase the necessary safety accessories, like wakeboard vests, a flag, and possibly wakeboard helmets (especially for kids). Go to the Water Sports Industry Association to look up current and historical laws. Always put the flag up when someone is in the water. Be smart: Wear a vest. ​Another safety concern while wakesurfing is Carbon Monoxide (CO) poisoning. Most of the time the rider is not exposed to very much CO, but the people in the boat may be exposed to a lot. It depends on how the boat is set up, where you are sitting, and the direction and strength of the wind. It doesn’t hurt to always be fully aware of the possibilities.